Our sewalong starts January 24, but I wanted to give you some time to start assembling your tools and supplies. Here’s what you’ll need. Main fabric. The first and most obvious thing you need is outer fabric. For the coat (version 1), this is likely going to be a wool coating or heavy wool flannel. There are many kinds of wool you can choose from, but you’ll find most of them labeled “coating” or something along those lines. If you’re doing the jacket version, a canvas (waxed or plain), heavy twill, denim, or waterproof fabric will work. This version is unlined, so you want to make sure it feels good against your skin and has enough structure to look good on its own. Think weighty and crisp. Fusible interfacing (v. 2). Interfacing is used to give structure to the sleeve tabs and front facing of the jacket. Choose one that’s light, since fusible interfacings usually add more stiffening than you might anticipate due to the glues. I have a fondness for knit interfacing because of its drape. Hold the interfacing together with your outer fabric to see how they feel. Lining fabric (v. 1). 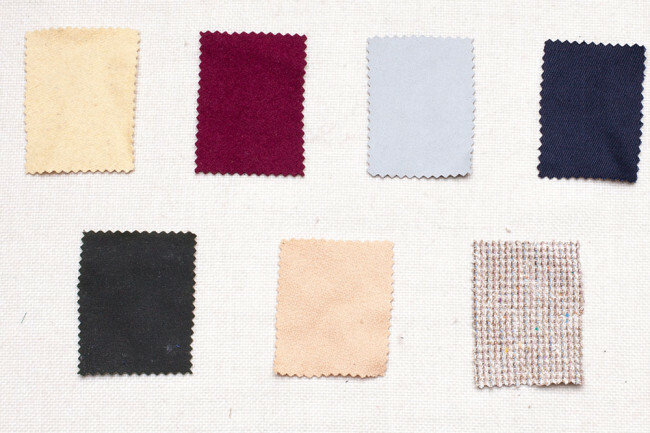 This is the fabric for the inside of your coat. The traditional choice for a toggle coat is cotton flannel. The solid coat with a plaid flannel lining is the quintessential choice, but any soft flannel would be lovely. 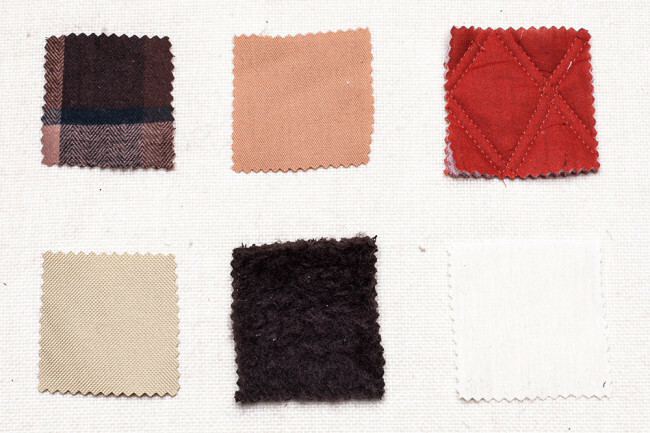 If you’re making a less traditional coat, other lining fabrics will work too. Rayon linings, soft twills, even silk can work. What about a pre-quilted lining for super extra cozy warmth? Interlining fabric (v. 1). Some people might want an interlining for warmth. My one recommendation here is to check to make sure the finished coat will not feel too heavy. There is a lot of fabric in this coat, so wool + interlining + flannel lining can weigh a lot. Some good choices are lambswool or plain flannel, or fabrics sold specifically for warmth. Test garment fabric. Buy extra muslin so you can make a test garment and fit it before sewing. If you have some inexpensive fabric lying around that more closely matches your main fabric, you could also use that. When making test versions of the jacket, we bought some cheap canvas to test it out. Light flannel for sleeve heads (optional). Sleeve heads are optional, but recommended. They help shape the cap of the sleeve and disguise the seam allowance. You can buy them online, but later I’m going to show you how to make shaped sleeveheads from cotton flannel. 1/2 yard will be more than enough. Ten yards of 1/4″ wide double fold bias tape (V. 2). You’ll use this to finish seams on the unlined jacket. You can purchase it, but it’s also fun to make your own! You can use an interesting color or pattern for something unexpected. Silk thread. Choose a silk thread in a contrasting color to use for basting. Polyester thread. 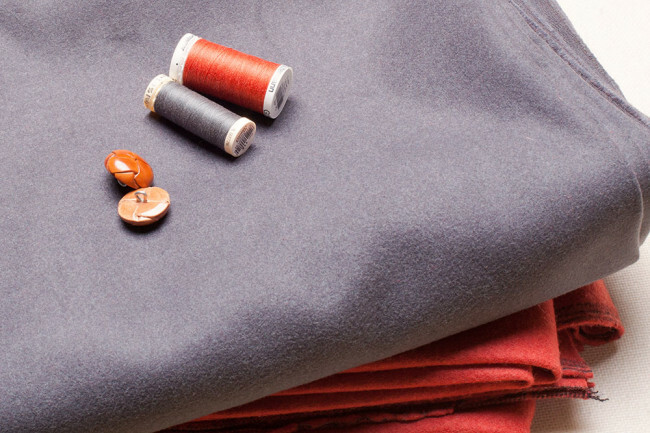 Choose a polyester thread to match your main fabric and some to match your lining fabric. Four 1” buttons (V. 1) or two 1″ buttons (V. 2). These will go on your sleeve tabs and the hood tab (for the coat). Leather buttons are beautiful on this coat, as are wood or coconut. But any sort of button you like will do. Four toggle closures. You can purchase these, or make your own. We’ll have a tutorial on making toggle closures, in which case you’ll need cording and toggle buttons. Hand sewing needles. You’ll be doing plenty of hand stitching, so grab some of these. Point turner. A bamboo point turner will help you get sharp points and corners, and also help push out seams so you can press them evenly. Steam iron. Perhaps this goes without saying, but you need an ironing board and steam iron. 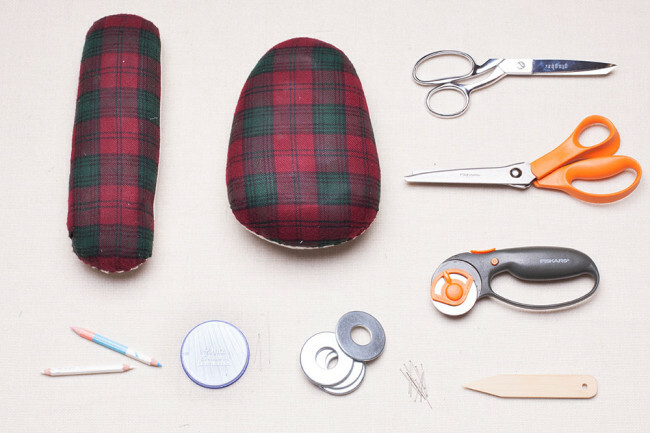 These tools will be almost as vital as your sewing machine! Tailor’s ham (recommended). A tailor’s ham is not strictly necessary, but it will make pressing certain parts of the garment much easier. Seam roll (recommended). A Seam roll helps you to press without the seam allowances showing through. It’s also useful for pressing sleeves. You want to remove shrinkage from your fabric before your garment is sewn. Even if you’ll be dry cleaning a wool jacket, you need to eliminate the shrink that will happen eventually. Wool is very prone to shrinkage. Dry cleaning. Take it to the dry cleaners and ask them to preshrink it. This can be expensive and you may need to hunt around for a dry cleaner who understands what you’re trying to do. London shrink. Take a bed sheet and wash it, then lay the damp sheet out flat. Place your wool on top and roll the sheet and wool up together. Let it sit overnight, then unroll it in the morning and let it dry completely. Once it’s dry, press the fabric with steam. Dryer shrink. This tip comes from Pam of the sewing blog Off the Cuff. She recommends placing your wool in the dryer with a damp towel, drying at high heat for 30-40 minutes. You may want to test this with a swatch beforehand, but I’ve found it a reliable method. Preshrink your lining fabric by washing it in whatever way you intend to clean the final garment. If you’re using cotton flannel, I also recommend letting it hang over night before cutting. Flannel tends to have a loose weave, and can grow vertically with wear, so I like to help it along before cutting. Is there anything we’ve missed? Any fabric questions you have? Thanks for the materials list. I’m off to make a tailor’s ham and a seam roll from my scrap basket and buy a point turner (I usually improvise with a butter knife or chop stick). so i’ve never made a jacket before and i just bought my first bernina! i want albion to be my first big project. i’m thinking i want to make version one but for early spring. does anyone have fabric suggestions? i’m thinking canvas with a flannel lining would be good for gross philly days in march. what weight canvas would be good? and does anyone have tips for sewing with waxed canvas? Will you be offering this pattern at a sale price for the sewalong? Will you be posting resources for the Albion? My husband would like his to look EXACTLY like the model’s and I can’t seem to find that lovely plaid flannel for the lining anywhere. We bought that flannel locally here in Portland, so I’m not sure where you’d get it! I’m sure you can find some great plaids, though. I’m thinking about trying this out with a few modifications. I live in LA so the full coat would be overkill. Besides, I want to make the Lady Grey. Sarai, would a wool suiting or a medium weight wool work for the jacket? I think those would be fine. When you say “jacket” do you mean the unlined version? Because in that case, you’ll want to check that the wool isn’t too itchy against your skin. If you’re doing a lined version, you also have the option of adding a light underlining to give it a little more body. Sometimes suitings can be flimsy on their own, but it really depends. Thanks. I think I want to do the jacket so maybe I will underline with something thin. Would this fabric be good for Version 2? I am thinking of light pink bias tape for inside… it would look super cute, I think. I really like that fabric, Amy. Great color. Lining the jacket instead of the coat would be extremely easy! All you need to do is shorten the lining, and follow the coat instructions rather than the jacket instructions. Another method of preshrinking wool is by using steam. Just warm your iron to maximum and adjust to maximum steam setting. Lay your wool over the ironing board or hang it over your shower curtain rod. Position your iron about 5 cm (2 inch) away from the fabric and steam away! I don’t see a picture of the coat ??? I just made Lady Grey with Blue Cashmere from my Grandma and a fun silk inside. As soon as I can I will post it so you can see. It is lovely and was easy to sew. I have my fabric all ready to go!! I can’t wait to start this sewalong, and the prize is ah-mazing! Question regarding interfacing: what would be a good non-fusible interfacing for a medium-heavy weight wool coating? I don’t love fusible interfacing, and I have plenty of cotton muslin, cotton flannel, wool flannel, and silk organza on hand. Would any of those work? Are you just using it for interfacing, or doing more of an interlining (i.e. the whole coat) for warmth? If it’s the former, I think muslin would be a good choice. For added warmth, the flannels would be great too. Well, now I’m thinking a toasty interlining sounds good. (I’m scarred by the polar vortex.) Would it be wise to interline the front and back, but not the sleeves? I also would like to line the jacket. Was this questioned answered? See the answer above, Jade! It’s extremely simple to adapt that way. Where in Portland is the best place to go for a great wool selection? I seem to go to the inner PDX stores that carry mostly cotton. Thanks! I really need to do a PDX fabric shop guide! For the biggest selection of wool, I like Mill End (outer SE) and the Pendleton Woolen Mills outlet (conveniently right up the street from Mill End). Pendleton has AMAZING wools. There are sometimes great deals there, but the wool itself is pricey (worth it, though). Mill End has a really large wool selection in all different weights, and they carry Pendleton too. I really enjoyed using wax canvas for the Cooper, and I’d like to use it for the jacket (v. 2) Albion. Do you have any recommendations as far as weight? The ounce weights listed for these fabrics online don’t mean much to me and it’s almost impossible to find this kind of fabric where I live. Also, where did you find toggle closures? The web isn’t giving a wealth of options in this department. I think the waxed canvas we used is in the 10 oz range. It’s about the weight of a standard canvas duck cloth. We bought our toggles locally, but have you checked etsy or ebay? You also have the option of making your own (we’ll cover this in the sewalong) if you find toggle buttons that you like. Thank you! I am really excited for this Sew Along. Hello, I can t wait for the sew-along! This will be my first participating. Along those lines I would love to make modifications to the coat maybe add a stand funnel type collar or any collar. Will you guys be offering any help with small changes so I can personalize the coat? Im a little nervous doing them myself. I thought about finding a pattern for one but I don’t know how to attach it and I am not experienced in the coat making department. Thanks! We don’t have a collar tutorial planned for the sewalong right now. Maybe it’s something we could cover in future posts. A funnel collar would be especially easy to add. The shoulders might be a bit broad for women, but we are going to cover making them narrower during the sewalong. So I would still go by your chest/bust measurement (provided you want the amount of ease indicated). I’m a women’s M and the S fits me well. It’s a tad broad in the shoulders, giving it a slight dropped shoulder. It doesn’t actually look bad this way since it’s a unisex style but I’d probably narrow the shoulders a tad for myself. I’ve traced off all the pieces and am off to a couple of fabric stores today :). One question: how far in from the front edge is the center front? In other words how much overlap is there? like to mark CF on my patterns. Can’t wait, this is my first sew along ever! I found a great selection of toggles from Pacific Trimming. Shipping cost was very reasonable and arrived in just a couple of days. Have been looking everywhere for a great quilted lining fabric – I have to ask – where is the wonderful red quilted swatch in your picture from??? I can’t wait to start with this sew-along, I’m going to make a coat for my boyfriend. It will be my first sew along and the first time I will make something for a man. Scared and exited…..! I bought some wool fabric and didn’t realize until I got it home that it smell funny (maybe musty, or moldy not sure) I’m just wondering about cleaning it. I looked some idea’s up and I think I should wash by had with not that much agitation, use vinegar in the rinse and then use sunshine (thought that may be hard this time of year) can I tumble dry? should I use a cool temp on the dyer? Is there any soaps or other methods that would work? Can’t wait to sew with wool since I never have! Does anyone have a good online source for waxed canvas or cotton? Iam also trying to figure out what fabric to use for Version2. I like the link above for fabic.com; that looks really good. Is there an inside liner or is it just the single fabric used on both sides for version 2? Version 2 is an unlined jacket. The interior seams are finished with a combination of felling and binding. Version 1 is a flannel-lined coat. Hope that helps! I am down to two fabrics, 1st is a 6 wale tan corduroy. And the other is a tan canvas. Any thoughts on the corduroy for version 2 ? woven elastic tape are located throughout us. Underwear, belts, bra straps, and shell holders in hunting vests all use elastic. It is actually critical to notice that woven elastics can be found in two kinds: fold in excess of and flat. Fold more than elastics easily fold when strain is used. These are typically usually applied in cases that need convenience, for example underwear waistbands. Elastics that don’t fold-over are sturdier and keep taut when force is utilized.